Here in Brightwood, on the western slope of Mt. Hood, the days have been hot and dry. Consequently, the edible mushroom season is suspended until the generous rains of autumn anoint the landscape with life-generating moisture. Only then will our beloved chanterelles be coaxed into action, fruiting suddenly and abundantly, carpeting the forest floor in celebration of yet another mushroom festival. Oh, the wait seems so long ... can we be patient for the next month or so? And how will we be patient? 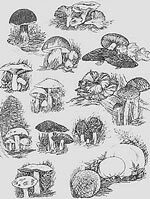 Personally, my only relief comes from searching for new recipes to try with the upcoming fungal abundance. I've found that there's a certain amount of solace that is derived from daydreaming, from seeking alternative preparations to enhance our fungal table. Chef Bonnie Frumkin Morales's Braised Chanterelles and Potatoes recipe is high on our list of recipes to try with the initial chanterelle foray. And, it's one that we'd like to share with you even though it's not yet gone through our "official taste testing" process. Why? Perhaps because it seems to us that this simple preparation just has to compliment the delicate flavors of the chanterelles. 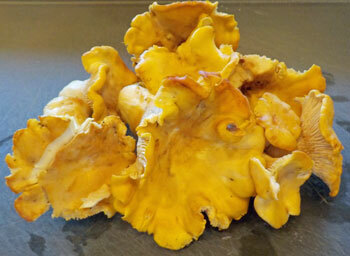 Or, perhaps because Chef Morales' recipe, as published in her debut cookbook KACHKA, would appear to allow the flavors of the fresh chanterelles to blend so divinely with the other ingredients. If you too are impatiently awaiting the first edibles of fall, tuck this selection into your Recipes-To-Try file and relax. The revitalizing rains will be here soon enough, and we'll be ready for what happens next! our anticipation of the upcoming fall mushroom season.